Last week I blogged about our well built step and door. We've travelled with it for over a month now and it really is working well. 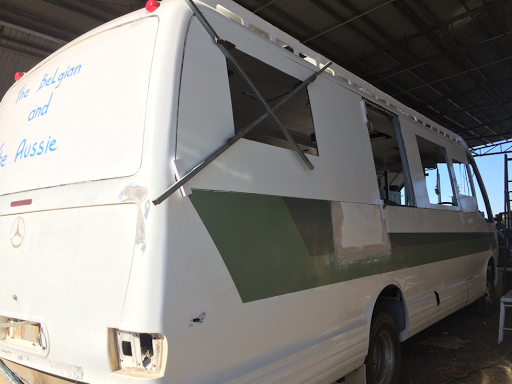 Early in the project we'd stripped almost all the glass out of the school bus. The large school bus windows hadn't been the type you could open (just small ones at the top for opening) and H had way more vision than I did and wanted walls with double paned windows in appropriate places. (I would have just blocked them out, like most DIY conversions seem to). Additionally, we'd bought the bus with a crack in the front windscreen and we'd accidentally cracked a front corner quarter window while removing the glass beside it. To make the new walls we used composite panels and we were lucky enough to get (free) a couple of large safety warning signs in that same material that we could recycle into our project. That was a significant saving and remember our old motorhome Blac? Blac was built with recycled Belgian motorway signs (see our most popular post list). 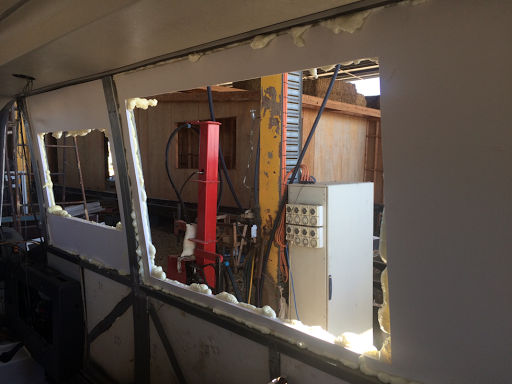 Window holes were cut in the panels before we put the panels in place. First the outer panel, then as much recycled foam insulation as we could fit, then the inside panel, and then we filled the gaps inside with spray expanding foam. Blu is truly well insulated and you can actually be inside with just the roof hatches open on a hot day and it's okay. Finally the windows could be installed. These are European style RV windows: 2 of the biggest we could get in the living area, 2 smaller ones in the private bed area (all hatch style), and a sliding one beside the driver. The hatch windows are readily available in Australia (Dometic), but we had to search more for the sliding window and found it available from Southern Spirit Caravans in Geebung (Brisbane). All of these windows have built in blinds and screens which is a tidy system until the insects get squished into it. The blinds are perhaps built for European conditions, i.e. Less insects. We've had days in this trip already where during the day the flies were relentless, then, as the sun sets the flies leave and the mosquitoes attack agressively, and then later the moths try for any light you have shining, even the little lights on things like the radio, when you attempt to sit in the dark with just the radio for entertainment. I like the windows more than I dislike them but I do find that their white screens isn't as good as Australia's typical grey/black screens, the insects do get squished into the blind and the screen in the rolling action, and that the screen on the sliding system is a silly system, especially at night, as the insects come into the section between the fixed window part and the screen and get stuck there. Also, clipping the screen to the blind is tricky, but I'm perfecting that talent each day.